Well, the party is over...or at least the mild weather is. Cold blowing snow has arrived. That's a picture of the Mundo as I left for work this morning. I usually don't ride this bike during heavy snow. One would think--that because of its weight and length--that it would be good in the snow. It's not; at least that's my opinion. Because of the temperate climate this year (up until now) I have not prepped my winter bike yet...so there it sits with a rusty chain from last year, two tires in need of air, and brake calipers that are all but seized up. When I ride the Mundo in the snow I find its weight and length awkward...and like a pickup truck with nothing in the rear end for traction, the rear tire slips and slides easily. As it turns out, when I arrived for work I found we were closed on account of the weather...looks like a nice day to say hope and fix my winter bike. 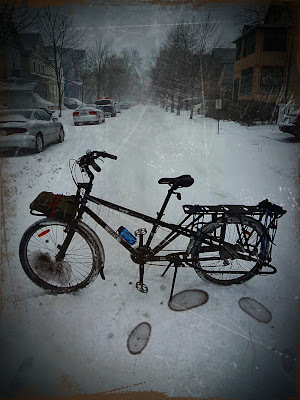 Anyhow, I'd be interested in hearing if others ride a Mundo or other cargo/longtail in the snow. As I work from home, I haven't been using my Mundo lately but I have been walking to my 3 times a week duplicate bridge game. I will walk within a mile and drive if over that. I am a little shy after my badly broken ankle in June and will start with the Mundo up in March or April - when the salting is over. Here in St. Catharines, we have just had a few inches this year. What a difference the 30 miles between us makes. Dan...it is quite impressive what 30 miles makes, but I'm assuming you are still feeling this current cold snap. I hope your ankle is healing OK.